As we come to the end of 2010, it also heralds the end of my time at Legal & General – and what a great time it has been! During this year, I have been invited to speak at a number of conferences on the topic of social learning and knowledge management – the highlight though was my time at Saba People 2010 in Boston where I collected an award for Legal & General’s use of Saba’s collaboration tools. 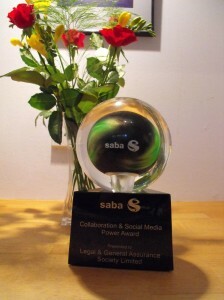 This adds to the eLearning award gained in 2009 and our contribution to Saba gaining a CLO award in the same year. What has also been interesting at many of these conferences is the re-emergence of knowledge management as a hot topic and the links between KM and social learning/social media. My old Nonaka & Takeuchi slides still have some life in them yet! I have an article on the theme of Knowledge Management & Learning in progress for a US based HCM Magazine which I hope will be published in 2011. I was also interviewed by KM World in October – you can read the article here. I have also spent more time this year working with open source tools – this blog is a good example of that as is the Drupal based website for Uckfield Concert Brass and the owners discussion forum created for Vila Branca in Portugal. All of this plus my Moodle & Joomla sites are hosted for me by www.voxdomains.com where I get 10 sql databases for less than $10 a month. Looking forward to 2011, I am expecting to be available from early February onwards – watch this space! (Potential employers can find out more at http://uk.linkedin.com/in/andywooler).